While the plague is going through my house, I was trying to figure out what to do blogwis. My awesome friend Cristi from BentOnBetterLunches offered to share a guest post for me because she is a wonderful person! I'm so berry thrilled to be here! 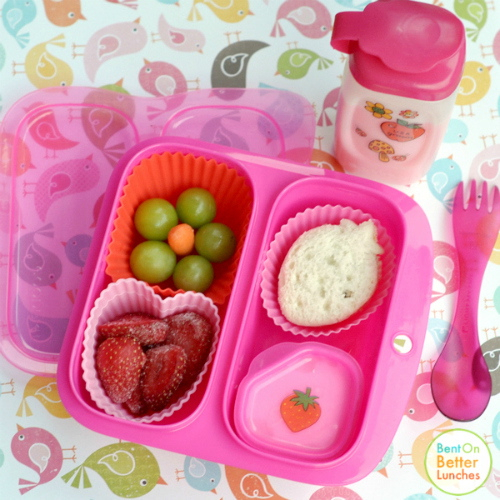 No, seriously, wordplay aside, it's truly an honour to be guest posting at What's For Lunch At Our House, one of my own inspirations for bento & blogging! Birdie asked for a strawberry lunch. Unfortunately I could not find any decent fresh berries! I did have some frozen... I'm sure they thawed by lunch :) The grapes looked good, so I arranged some around a baby carrot in a flower shape. 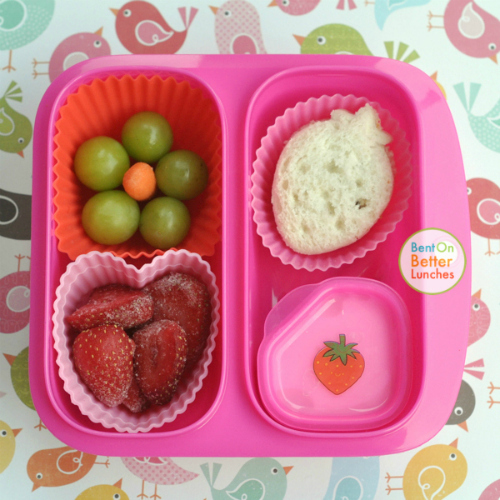 Birdie's preschool allows peanut butter so I gave her two little strawberry-shaped PB sandwiches, stacked, and in the dip cup, a scoop of yogurt, coloured pink with strawberry syrup. I also gave her strawberry milk to drink for a treat, she loves pink milk! Thank you so much for this awesome opportunity Shannon - I love your blog! I never put milk in their thermoses. I bet my kids would love that! Cute lunch! Hope you are feeling better Shannon. I love Cristi's lunch!! The strawberry theme is just adorable!